I have some fun news for you and also a fun card to share. I was selected to become a design team member for Whimsie Doodles. What an honor! This is a super fun digital stamp company and I'll get to play with all their designs...and show them all to you too. I'll post both here on my blog and also on the Whimsie Doodles blog. Today is the day that the team announcement takes place...so you can check out that post and meet all my new friends too. 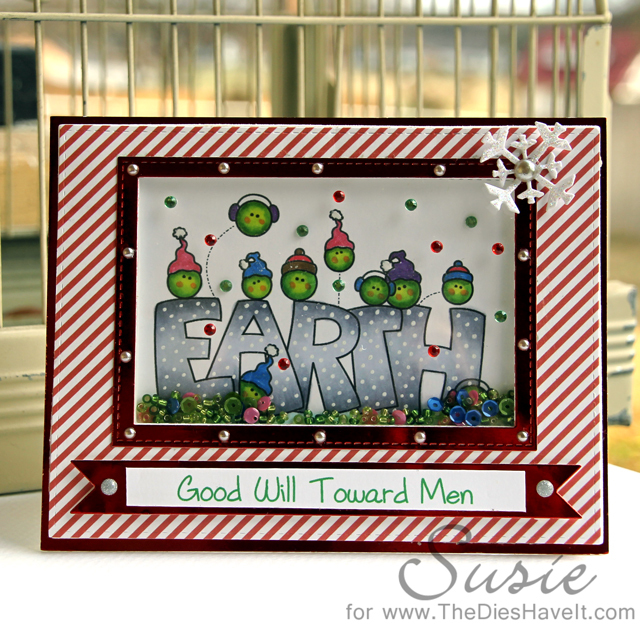 My card....Peas on Earth - Good Will Toward Men makes me giggle. I don't really know anyone who likes to eat peas, but they were super fun to color! You can see the black and white digital image right here (scroll down toward the bottom of the page). I hope you have a wonderful day and I'll be right back here tomorrow. A formal welcome to the team, Susie! You already know how much I love this clever card! Hi Susie! Good to say hello to a fellow DT newbie.. and I'm LOVING your fan fun card.. brilliant fun image and perfect sentiment!! so super cute, i love this image too!! looking forward to getting to know you!! I have a secret...I adopted this card from the Crafty Scrapper yesterday :) LOVE it!!! Eileen, I love that you adopted this card! I hope to see you again soon at TCS.